Pope Francis says Mass with Melkite Greek Patriarch At Mass on Tuesday morning in the Casa Santa Marta, Pope Francis concelebrates with the Melkite Greek Patriarch of Antioch, calling it a sign of the Apostolic Communion between the Latin- and Eastern-rite Churches within the universal Church. 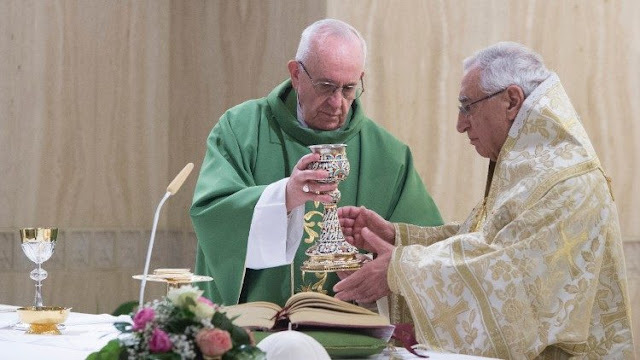 Pope Francis concelebrated Mass on Tuesday morning with the Melkite Greek Catholic Patriarch of Antioch, Youssef Absi. Instead of delivering a homily, Pope Francis said a few words about the meaning of the day’s celebration, at which members of the Melkite Greek Synod participated. “This Mass with our brother, Patriarch Youssef,” the Pope said, “confirms our Apostolic Communion: He is the father of a very ancient Church, and he comes to embrace Peter and to say ‘I am in communion with Peter.’” The Holy Father said this was the meaning of the Eucharistic celebration. He said the Melkite Greek Church is “a rich Church with its own theology within Catholic theology and with its own marvelous liturgy”. He said the Mass was being celebrated for the people of the Melkite Greek Church, “for the people who suffer, and for persecuted Christians in the Middle East, who give up their lives, goods, and property because they are driven out.” Pope Francis said he also offered the Mass for the ministry of “our brother Youssef”.